Just about a week ago it seemed like the most popular of my apps was my Desktop Translator, which was a Silverlight Out Of Browser (OOB) app. However, since Silverlight does not seem to play very well with Edge, the default browser in Windows 10, people was struggling with installing the app. At that point I also had a Translator for Windows 8 and a Translator for Windows Phone 8. So, it seemed like a good opportunity to try out the Windows Universal platform and make my life easier along the way. Get it now for Windows 10 here (and probably with the same link for Windows Phone 10 when it becomes available). I didn’t quite have time to add new features to this universal version of the Translator. However I did add the capability for translating the text as you type it. I thought that could be handy. And interestingly, the Windows 8.1 URL would work even for Windows 10 people, which is great! It has been a long way for this little app since releasing it as a gadget for the Windows Vista sidebar. Who knows what will come next! A few months ago my team made available the management of cloud services in the Azure Preview Portal. Check out this video where Marck, Nick and I do a quick demo of what is available in this nice new experience. The Windows Phone 8 SDK was publicly available last month so I thought the Translator for Windows Phone could take advantage of some of its new features. The upgrade process took me a few days, mostly because of not been able to work on it for more than an hour or two on each session, but I’m glad to announce it’s finally ready and available for download! Get the Translator 2.0 here. 1. 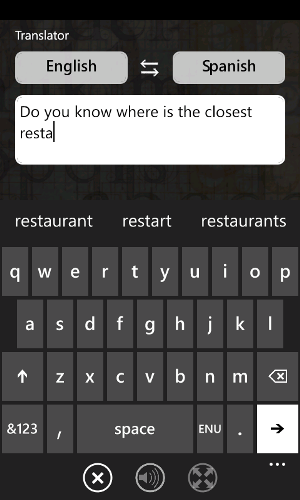 Speech Recognition: You can now use the new Speak button to say a word or phrase to the app. It will recognize your spoken text and immediately translate it to the currently selected target language. Cool feature and actually ridiculously easy to implement thanks to the new Speech APIs. 2. Better language support: Many people complained in the past about the Translator not been able to display text in a few languages, been Hindi among the most requested. This was sad because the Translator was actually able to translate the text to those languages but could just not display it in the Windows Phone 7 platform. Gladly, and without having to add a single line of code, the Translator can now display text in Hindi and 20+ new languages! I hope this helps and please keep sending feedback either from the app itself or via this blog. I’ll do my best to keep improving the app to make it as useful and easy to use as possible. 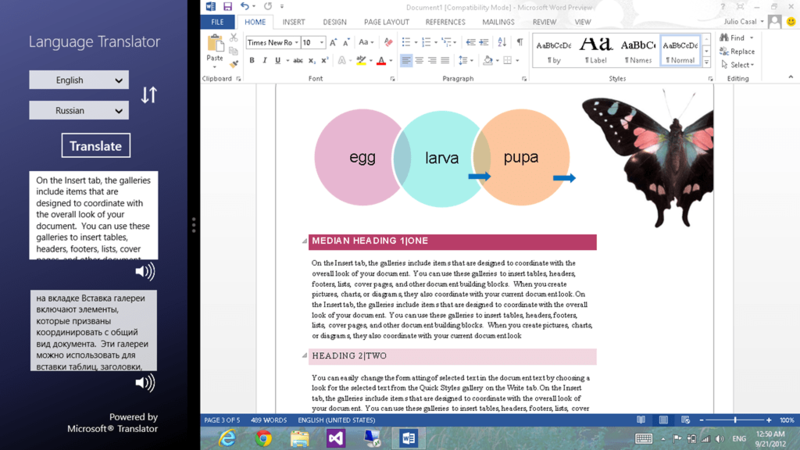 Language Translator for Windows 8 Now Available! 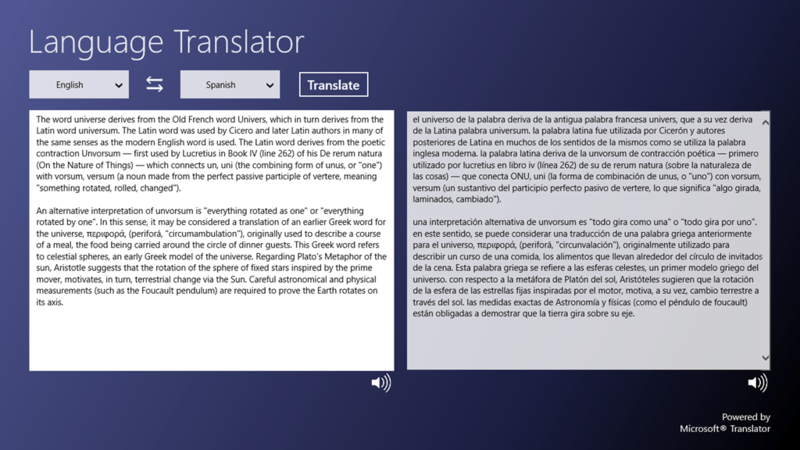 Been working on porting my Translator to a Windows Store app and it is finally published! 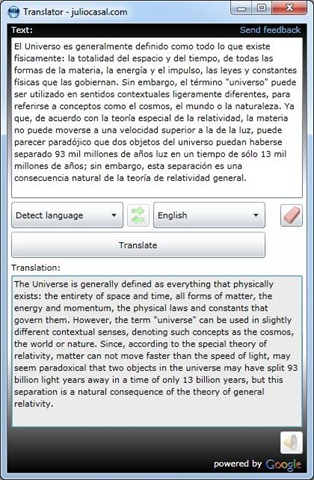 Most features available in the Windows Phone and Desktop versions of the Translator are also available in this new version. However there is one new feature, available only thanks to Windows 8, that was my main driver to create this new port. This new feature allows you to send text for automatic translation directly from any other Windows Store app that supports sharing. 1. 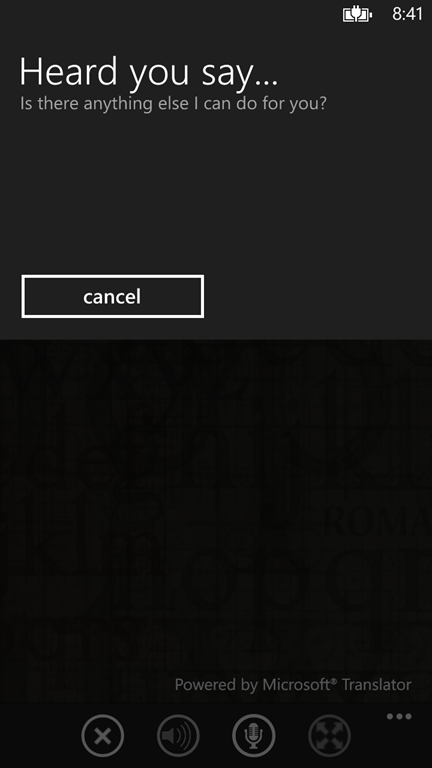 Select some text in the Windows Store app, open the Windows 8 charm bar and tap on the Share charm. 2. On the Share charm tap on Language Translator. 3. The Language Translator will slide from your right, will auto detect the language of the text you shared and will immediately provide you a translated version in your language of choice. 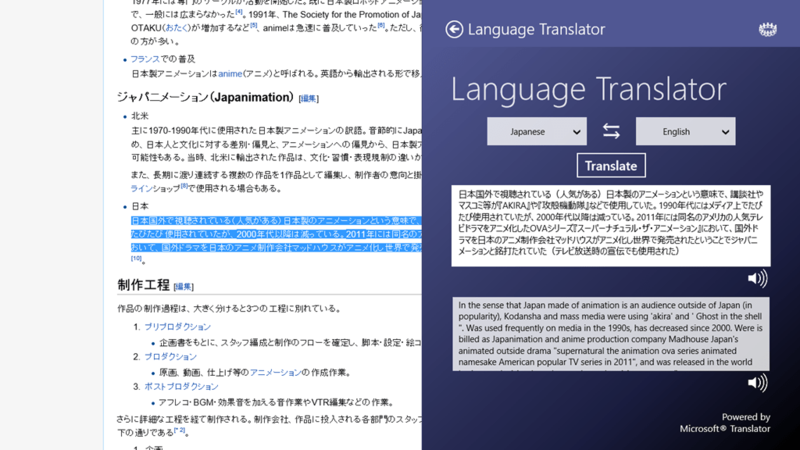 If you find yourself using the Language Translation very frequently, you can take advantage of Windows 8 snapped view to snap the Language Translator to any side of your screen. It will resize properly and stay there for quick access for as long as you need it. I hope you enjoy using it as much as I enjoyed working on it. Please send me any feedback you might have on the Language Translator and, if you like it, would appreciate if you can rate it in the store. Google Translate API is now a paid service only, which means that both the Translator Desktop and the Translator for Windows Phone should require some sort of payment from end users. This could be via a direct purchase or via ads. As of November 2011 I no longer live in Mexico, but in the United States, and the visa that I received does not allow me to receive any payments from anybody different from the employer that sponsored my visa. So even if I keep selling the Translator for Windows Phone 7, I am not allowed to actually receive the money from the payments. Those two combined reasons make it impossible for me to receive any payment from Translator’s users and justify the cost of adding support for the Google translation engine. So, for now bot the Translator Desktop and the Translator for Windows Phone 7 have been updated to only support the Microsoft Translator engine, which still offers a free option. I am so sorry for this. However I can ensure that I will keep updating and supporting both translators to make sure they keep meeting all your expectations. 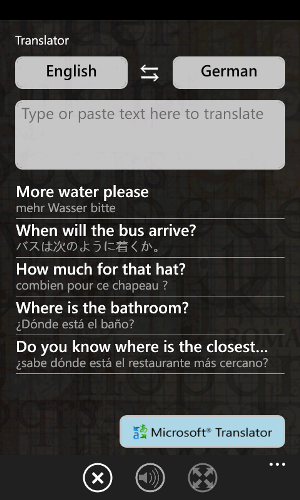 Windows Phone 7 Translator 1.6 Now Available! 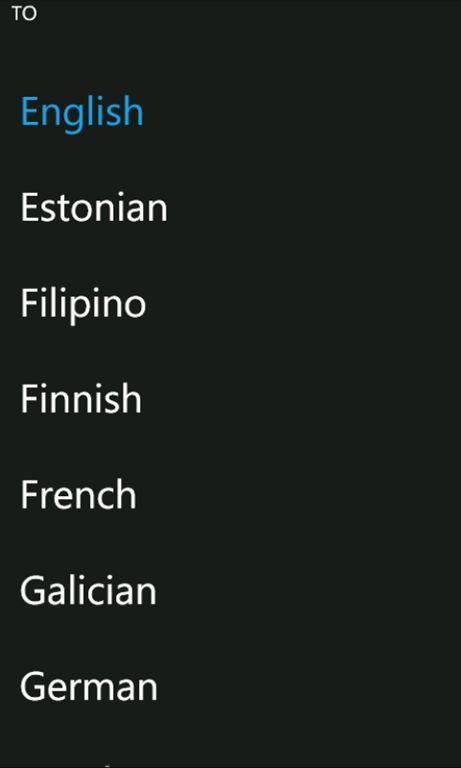 I am so happy to announce that the new version of the Windows Phone 7 Translator is now available on the marketplace! I’ve been working hard on this one for the last couple of months so it’s great to finally see it published. Focus on this major update is in the introduction of several productivity features, full support for Windows Phone 7.5 (Mango) and bug fixes. Let me introduce the new features in this quick overview. Some screen space was saved by removing the Translate button. The translation is now triggered by using the Enter key, in the same way that you would navigate to a page by hitting Enter after typing a URL in Internet Explorer. This has been requested for a while. You will now see big letters for your translations, which is quite useful for easy reading. Also been requested for a while. The NoDo update added Copy/Paste support, but such support doesn’t work for TextBlocks, which is what the Translator was using for the translated text. I replaced the TextBlock with a styled TextBox and now you can not only copy the translated text but also do it with a single click. This is very useful for sharing your translation with someone else. To go full-screen you can click the new Full-Screen button in the icon bar or you can just move your phone to a landscape position after translating your text. Sometimes you find yourself translating the same texts once and again and again. To avoid asking for these recurrent translations you can use the new translation history feature. The Translator will automatically store your last 1000 translations for easy access and you can access them right from the main screen. 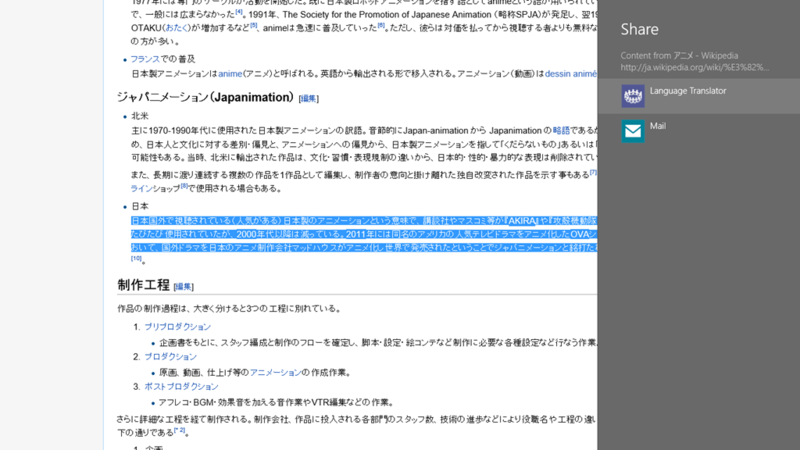 To see the translation history just clear the input textbox by clicking the Clear Text button in the icon bar. 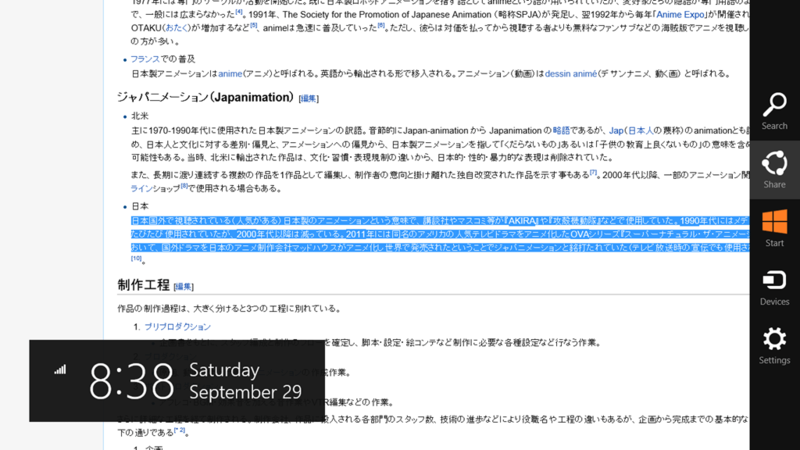 The translation history will even remember the translation engine you used when performing the translation. I got quite impressed when I read about the huge list of new features introduced by the Mango update. But the one feature that really impacted the Translator was Fast Application Switching (FAS). Turns to be that a new ‘Dormant’ state has been introduced to Mango applications which will allow your app to remain in memory without been tombstoned. Without an appropriate handling of this new state your app will not take any advantage of FAS and might waste some precious performance savings. The Translator is not only now fully supporting FAS but I also completely reviewed the application lifecycle, which was less than ideal and rewrote it to make sure all possible state transitions are handled appropriately. Introduced the appropriate branding for both Microsoft and Google translation engines. Added a ‘Write a Review’ menu option that I hope encourages customers to share their experiences when using the Translator. Fixed many reported and hidden bugs. So that’s it! I really hope you all enjoy this update. And, as always, please contact me for any questions, issues and stuff you’d like to see in new versions. And have fun! 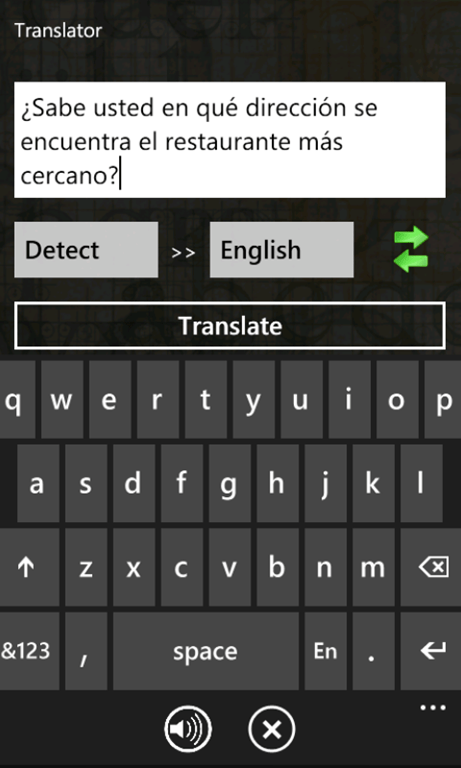 Translator for Windows Phone 7 Now Available! 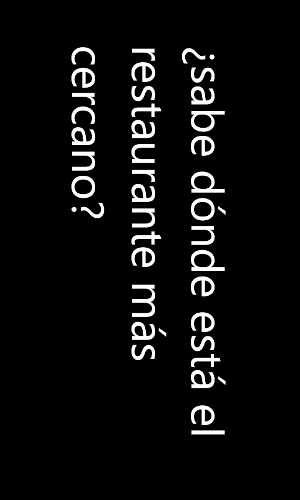 I’m very excited to announce that my Silverlight based Translator is now ported to Windows Phone 7! After thinking about the cool development opportunities that this awesome device brings to the mobile arena and given that the development platform for it is Silverlight (which I love), I thought it just made sense to prepare a WP7 version of the Translator, and I have to say it was a great learning opportunity! Translate any text to and from a wide variety of languages. Choose between the Google translation engine and the Microsoft Bing translation engine with the slide of a finger. The available languages and corresponding translations will vary with each engine (with 50+ languages for the Google engine, and 30+ for the Microsoft engine). Listen to your translations in the most popular languages. This is powered by the Microsoft Bing Text To Speech API. Use the detect feature to auto detect the language of any text. Quickly swap between source and target languages. The Translator will remember your choices for the next time you open it. I already have some cool ideas for the next version, to really take advantage of this fabulous device. So stay tuned! And, as always, all feedback is very welcome! Finally I got some time to finish publishing this small update to the Translator. The update itself was finished several weeks ago but deployment was a little bit of a challenge. 1. Configurable Translation Engine. This is by far the main feature of this version. You can now choose your favorite translation engine among Google and Microsoft. Each of them have some features that the other lack (like Google being much more accurate, while Microsoft being able to handle larger texts) so it’s good to be able to choose! 2. Text To Speech now powered by Microsoft Bing. There was no public/supported API from Google, so I decided to try Microsoft’s one (which is supported and very well documented). Plus Microsoft’s engine supports a couple of more languages than Google. 3. The Translator is back in Windows Azure. Yes, I moved the previous version of the Translator away from Windows Azure and now I’m putting it back in there. This is because now I have a pretty long evaluation period of Azure, thanks to the Bizspark account I got a couple of months ago (thanks Microsoft!). Azure is a great choice for the Translator as I can host the application there, plus it’s backend WCF service and the SQL Server Azure DB that records some info for me. This will free some of the bandwidth that was being consumed in my shared hosting and allows me to see a real app in action in Windows Azure, which is pretty exciting! That’s all for this minor revision. Still got tons of ideas for this app in the future, hopefully I get some time to work on them soon. All feedback is very welcome. It’s build on top of the just released Silverlight 4.0 and deployed as an out of browser application, which removes most of the limitations of running inside the Windows sidebar. It is now appropriately localized for English and Spanish so it will display an Spanish UI if your machine uses the Spanish version of Windows, and English otherwise. It no longer uses Windows Azure for storing the Silverlight xap file and the Translation Web Service. This is not because Azure is not good (it’s actually pretty cool) but because the trial ended and I just don’t have money to pay for it. 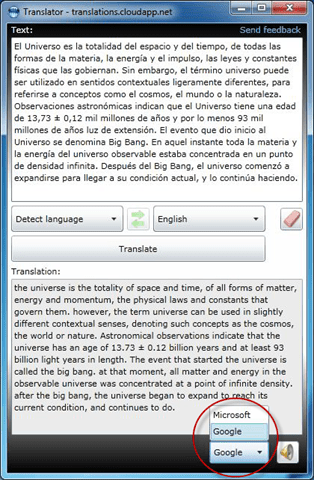 It can be maximized as much as you like in order to allow you to translate big amounts of texts. It does not require you to have your Internet connection as soon as you login to Windows as it is now installed in your machine and only requires Internet when you fire the Translate button. It will detect when your Internet connection goes down or comes back and give an appropriate friendly error message if no Internet is available. It will allow you to listen to the translated text in English, French, German, Haitian Creole, Italian and Spanish. This uses an unofficial API from Google, but seems to work pretty well. Only small texts supported for text to speech in this version (up to 100 chars aprox). It now includes mouse Copy/Paste functionality (thanks Silverlight 4!). It now works in both Windows 32 bits and 64 bits. The 64 bits scenario was just not possible while running inside the Windows sidebar. It includes a nice auto update model so it will detect when a new version of the Translator is available and prompt you to just restart the app to apply the update. I really hope this new release will fulfill people’s expectations and be a very useful utility to keep in your desktop. If you got any feedback you’d like to share with me please go ahead and leave me a comment below. I already have some ideas for the next version, so if you know of something you’d like to see in there just let me know!